If you’re looking for one pot mac and cheese that will have a delicious and creamy meal on the table, Instant Pot Mac and Cheese is the one you want! You can make it in minutes and it’s super family-friendly! I’ve always loved macaroni and cheese and it’s one of my daughter’s favorite foods. When we go out, she’ll order macaroni and cheese if it’s on the menu and I’m pretty sure she’d eat it for lunch every single day if I let her! We’ve tried tons of different macaroni and cheese recipes and always enjoy them. So when I got my Instant Pot, it only made sense to try making Pressure Cooker Mac and Cheese! This recipe has quickly become one of my favorites because you can make it all in one pot and it’s easy. On busy nights, easy is always the name of the game. So making food that I know the kids will enjoy that’s also simple for me in the kitchen makes this a winning recipe! If you don’t have an Instant Pot yet, then you need to get one! I’m pretty sure you can make everything you can dream up in one from breakfast to lunch and on to dinner! Plus there are some amazing dessert recipes out there too! We’ve got a 6-Quart Instant Pot and it works pretty well for our family of three adults and two kids. 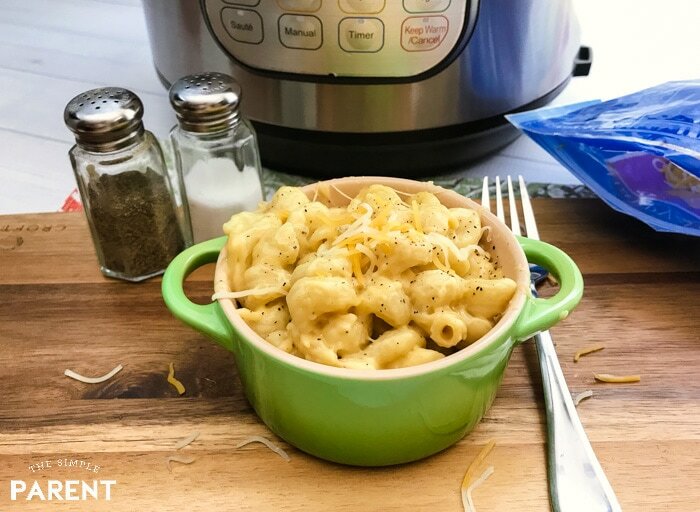 So once you’ve got your Instant Pot, you’re ready to make Instant Pot Macaroni and Cheese for your family! All you have to do is put chicken broth and noodles into the pressure cooker with butter, salt, and pepper. You’ll cook them for a few minutes then add in evaporated milk and cheese. Once it’s all melted, you can sit down and enjoy it together! Yes, it’s really that easy to make! Pour chicken broth and 1 pound of Cavatappi noodles into the Instant Pot. Top with butter, salt and pepper, and stir. Seal the Instant Pot lid closed and press manual. Set the timer to 5 minutes and make sure the seal is closed. Manually vent after the pasta cooks and the timer goes off. Once it is safe to open the lid, pour the evaporated milk and cheese over the pasta and stir until melted. Remember that the 5 minute cook time isn't the total cook time. It will take some time for your Instant Pot to come to pressure before the actual cook time begins. Depending on how much liquid is in the pressure cooker, it can take 5 to 30 minutes. 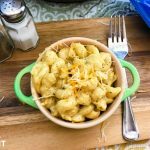 Instant Pot Mac and Cheese is an easy side dish to whip up while you work on another main dish, but I love that you can also turn macaroni and cheese into a full meal on its own. Or you can add any combination of these things to really personalize the recipe and make it your own! It’s also a great side dish with almost any main dish! We love it with hamburgers, chicken sandwiches, and fish! I think macaroni and cheese might be one of the most versatile recipes! 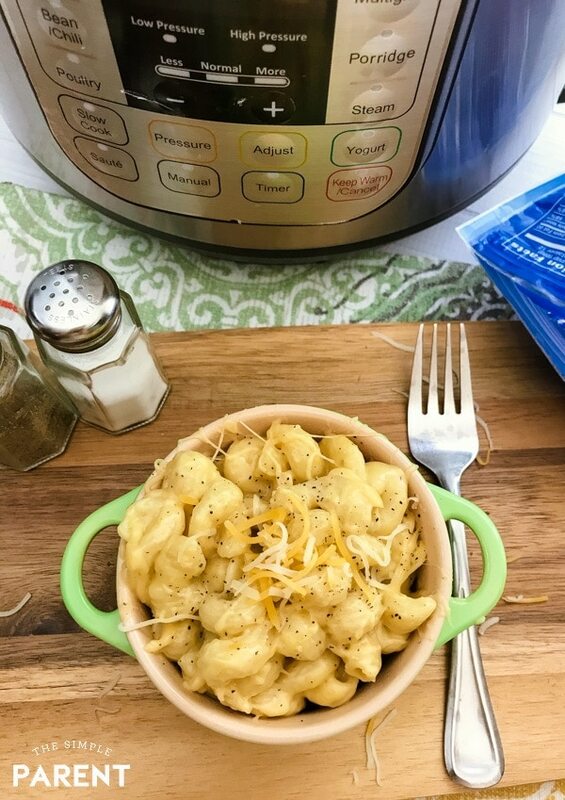 Your Instant Pot is the key to quick homemade mac and cheese! Can you make Instant Pot Mac and Cheese without evaporated milk? Absolutely! You can use different types of milk depending on what you have on hand or the flavor you prefer. Whole milk works well and I’ve also made it with skim milk. I think that it would also be great with heavy cream. Some people have recommended half and half to me as well, but I haven’t tried it yet! If all you have around the house is regular milk, roll with it! Can I use elbow macaroni to make this Instant Pot Mac and Cheese recipe? Yes, you can use any type of pasta that you would like, but I find that tubular shaped noodles work best. 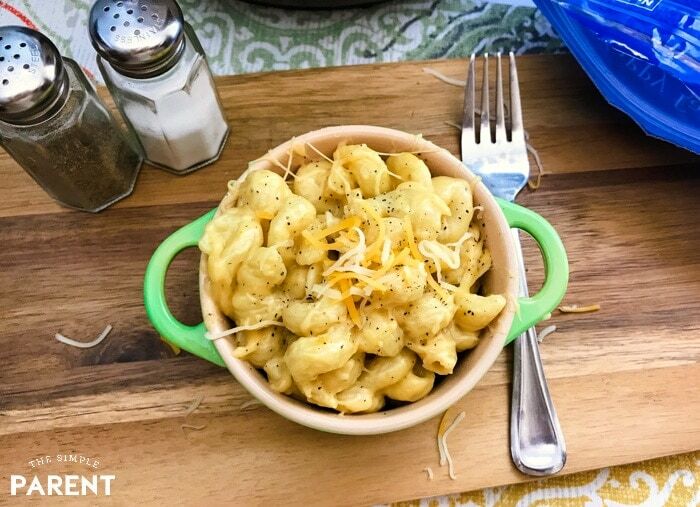 We love the Cavatappi shape because it’s fun and also holds the cheese macaroni and cheese sauce well. You can use elbow macaroni, rotini, rigatoni, penne, fusilli, and farfalle work well for this recipe. What kinds of cheese can I use to make macaroni and cheese in my pressure cooker? For this recipe, we used a combination of mild cheddar and parmesan, but you can tweak your cheese to your tastes. You can use sharp cheddar, white cheddar, monterey jack, colby jack, or even swiss! Our local grocery store has an amazing cheese department that I might have to explore the next time I make this recipe! Can I reheat the leftovers? Macaroni and cheese tastes the best when it’s fresh. But you can definitely reheat your leftovers. Dish it into a microwave-safe bowl. Before you pop it in the microwave, add a splash of milk to the bowl. Then heat a bit, stir, and heat again until completely warmed. 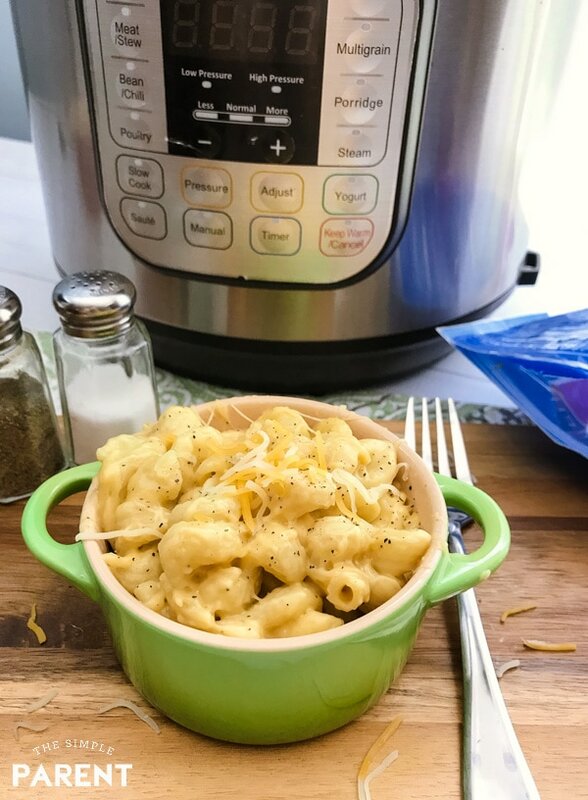 Once you try Instant Pot Mac and Cheese, you might never boil another pot of water on the stovetop again! It’s that easy to make! Leave a comment telling us about your favorite thing about macaroni and cheese. Or let us know about your favorite Instant Pot recipe! Mac and Cheese the one things that the grandkids will usually eat. Seems easy enough! Looks Delicious! I like that its simple. I love Instant Pot Barbecue Pulled Pork Sandwiches. I love the taste and how it is easy to make. My kids love macaroni and cheese so I love to make it. I like macaroni and cheese so much because it is such a simple dish, but also very tasty. I like the cheesy, gooiness of a good mac & cheese. Top priority is a tie between the correct ratio of cheese to pasta and the type of cheese used. good all comfort food. My favorite mac and cheese is made with 4 different kinds of cheeses. I love a shrimp boil in the instapot. Cheese and pasta! What’s not to love! I love all the cheese. I like instant pot chili. My favorite thing about macaroni and cheese is the golden brown layer of cheese on top when you pull it out of the oven. I don’t think the instant pot method would produce that, but that is not a deal breaker!!!! That is one food that we make that our kids all agree on, so if we had to cook it in the microwave, I would be fine with it. I like the gooey stringy-ness of mac and cheese! Mac and cheese is a favorite for all the kids I know. My favorite thing about macaroni and cheese is the cheesy comfort. My favorite thing about macaroni and cheese is that it is a versatile dish- it can be a side dish, a main meal, you can add ham- and that it is a win with everyone in my picky family! I like mac and cheese for its creamy deliciousness. I like to use a variety of cheeses for the best flavor. My favorite thing about Mac and Cheese is the smoked gouda I use. I’ve never used an instant pot but would love to make meatloaf in one. I love mac n cheese. To me it is the ultimate comfort food. It warm and cheesy and reminds me of childhood. I love the creamy cheesiness of mac and cheese. My kids would eat it every day if I let them. My favorite thing about mac and cheese, is that it is so filling, especially on a cold day. I like that you can add all different types of cheese to macaroni and cheese, and it just becomes more delicious. 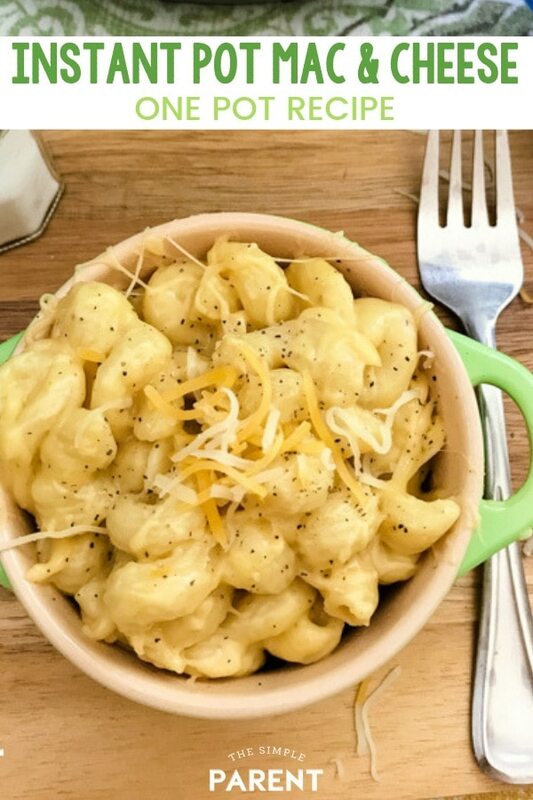 I love cheese so mac and cheese is a go to for many meals I make. My favorite part is when you bake it in the oven and it gets a crunchy top! I really like the Mac and Cheese because it is soft and silky and the taste can combine with several other tastes. Not too brasen. However, I would really love to try some other original recipes too; like macaroni, vegetable sauce mix, onions, green peppers, green onions. I’m a creative cook. The creamy cheesyness of mac and cheese is the best. We just made butternut squash mac and cheese in the instant pot and it was so so good! I love pasta and i love cheese, enough said! My favorite thing about macaroni and cheese is that you can add almost anything to it! I like chili, classic chili, or beef stew. I love the creamy saltiness of mac and cheese! I also love that it is a vehicle to add just about anything you want! I don’t really like mac and cheese, but I make it all the time for the grandkids. They like it gooey!! I am a cheese addict! I just love cheese, and the cheesier mac and cheese is, the better! I love that it’s something the whole family will love to eat. My favorite thing about Mac & Cheese is the taste — it’s DELICIOUS! My favorite thing about Mac & Cheese is when my daughter makes it from scratch with lots of cheese. My favorite thing about Macaroni and Cheese is that it is a huge comfort food for me. This is a food I turn to when not feeling good, down or just want to indulge in the cheesy pleasure. My favorite thing about Mac & Cheese is its versatility. I like using a variety of cheeses and also mixing in different vegetables and meats. I love this creamy mac and cheese and I love trying new variations of it. My favorite thing about Mac and Cheese is the cheese itself as I’m a big fan of cheese. And I also like that you can use just about any type of cheese in it, as well as add various things such as lobster, bacon or jalapenos. So you could eat it three times a week and it would never be the same dish. I love to make chicken and rice with veggies in the instant pot! Mac & cheese is just so good! There’s no words! It’s been my favorite food since I was little! Thanks sharing the recipe ! My favorite thing about mac and cheese is it’s very easy to change it up. Example one night traditional and the next you could do a Italian inspired with mozzarella,parmesan, sliced Italian sausage . I love the crunchy pieces on top. My favorite thing about mac and cheese is the melted cheese! I also like how creamy it is when made in the InstaPot! My favorite thing about Mac and Cheese is that its so versatile. You can use any type of pasta, any type of cheese and its always delicious. Its a go to meal at my house. I love bacon with my mac n cheese! My favorite instant pot recipe is beef stew. I love that macaroni and cheese is everyone’s favorite side! I love cheese and pasta so it’s a win, win for me. Plus it’s creamy! I like that it is so simple to make and it’s so good! Im wanting to try recipe saw online…crack chicken. Sounds wonderful and I know my family would love. I like th way it looks so sleek and modern & the size. My favorite thing about mac and cheese is that everyone in my house will eat it! I love how warm and comforting mac and cheese is, and I love how gooey it is. 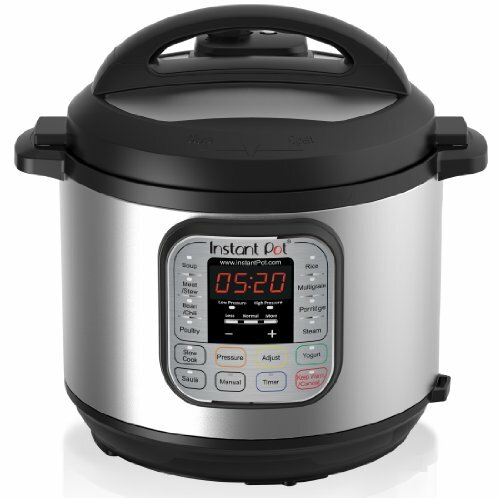 I am getting an instant pot for Christmas. This mac and cheese recipe is the first recipe I am going to try. I love mac and cheese because it’s such a comfort food and there are so many delicious ways to make it! Mac & cheese is my ultimate sick food, comfort food. I love how warm and creamy it is. My favorite things about Mac and Cheese is that it is easy to make and everyone in the family love it. Mac and Cheese is the all time comfort food in our family. I know that my boys will leave the table with full and happy bellies if I make mac and cheese. Mac and Cheese just warms my belly because I beleive everything is better with more cheese. I recently discovered a whole new world of mac and cheese add-ins at a southern restaurant in Portland- tomatoes & okra, gumbo, & meatloaf were the highlights f the options for our family. I never thought of just throwing leftover meatloaf into mac and cheese but it is really good. Anything pasta and cheese is my favorite. love it. My favorite things about macaroni and cheese are it is so good, easy to make and almost all like it. I Love that Mac and cheese is something I can make and my whole family eats it! It’s such a comfort food we all enjoy. My favorite thing about mac and cheese is that it is the ultimate comfort food – homey, gooey, yummy – I always feel better after mac and cheese. Oh.my.gosh. your recipe looks delicious! I love cheese and I love pasta = I love Mac and Cheese! Thanks and God Bless! Mac and cheese is such a great comfort food. It’s simple, but it’s easily spiced up! I love mac & cheese. It’s comfort food. I like the mac and cheese is so comforting! It’s the ultimate comfort food. I love adding steamed broccoli to mac n cheese. This recipe looks great! I’m very picky about my mac & cheese. I prefer some sort of crunchy topping on it, but I’m going to try this one! My favorite thing about macaroni and cheese is that it is comfort food in a pot and everyone loves it. The best thing about mac and cheese is all the gooey cheese. Mac and Cheese is just one of those ultimate comfort foods. It’s great plain but fun to dress it up. I love really cheesy homemade mac and cheese. It is one of my favorite comfort foods. My favorite thing is how easy it is to prepare and how you can switch it up with different cheeses or add ons like bacon. Mac and cheese is the perfect comfort food. It’s warm, gooey, and cheesy. It reminds me of the comfort of home and childhood meals. Homemade mac’ N cheese is such a comfort food to me! I’ve loved it growing up and cooking/ eating it as an adult has always brought me back to happy childhood memories! My favorite thing about Mac and Cheese is the comfortable feeling it gives you. It gives you a warm and satisfied feeling. I love that mac and cheese goes with just about anything. You can mix it with many different things and have a great meal. My favorite thing about mac n cheese is the versatility. I can use whatever cheeses I have on hand or I can throw in some veggies or meat. The possibilities are endless. Mac and cheese is a staple in our house. What’s not so to love about all that cheesy gooeyness. I love that it can be served quickly, can have meat or veggies added and that my children love it. I love that mac n cheese is a versatile recipe…you can add almost any veggie or meat to it and it tastes great! I like the gooiness of the cheses. My favorite thing about macaroni and cheese is the added crunchy texture. After cooking it, I like to cover it with bread crumbs and shredded mozzarella cheese and bake it.. I just love mac and cheese. I am so trying to make this one. I love that it’s something my whole family eats and loves. I love that it is a satisfying comfort food everyone loves! I love the taste of mac & cheese – especially homemade and not the store bought kind. I love warm, gooey, cheesy mac n cheese !!! My favorite thing about Mac & cheese is that you can make it into so many different things. It can be a side or a main dish. You can have it as basic Mac & cheese, or add things to spice it up like bacon, chicken, etc. It’s so delicious & creamy! This is now on my list to make. i love mac and cheese because it is creamy and delicious and a comfort food. I like mac and cheese because it is a classic comfort food that always is good for the soul! Your macaroni and cheese cooked in the instant pot, looks nice and creamy. We love homemade mac and cheese and have it quite often. I wish I had an instant pot to cook it in, though. Thanks for having the contest! I love homemade mac and cheese when it has lots of cheese. i love that mac and cheese is easy to make, and almost everyone loves it! Our favorite —> INSTANT POT MONGOLIAN BEEF !!! I love how ooey gooey Mac and cheese is. I love that mac and cheese is a fulfilling comfort food. I love mac & cheese with chicken and green beans on the side. The best is homemade mac & cheese with some breadcrumbs on top and a little bacon – and of course tons of cheese so it’s stringy!! Thank you for sharing this recipe! I love mac and cheese because it is the one food both my daughter and I love. I love the many different variations you can have of it. I love Mac n Cheese because it is so creamy and it makes me feel comfort, like when I was a kid at my grandmothers. I make a Hatch green chile mac and cheese. It’s amazing, I love that it’s rich and spicy! Mac and cheese is one of my favorite sides but I have never tried it in an instant pot. My fave recipe is beef and gravy in my pot! I would love to win this for my mama! The ooey-gooeyness. Plus the fact that you can eat it as a side, or add almost any ingredient to make it a meal. I like making stew with my InstaPot. OH MY its cheesy pasta whats not to love. Its warm and creamy and brings back childhood memories since I have had it all my life. 10,000 lbs of cheese and then throw in some chopped ham. My favorite thing about mac & cheese is it super easy to make and also a cheap meal! I will definitely try this! Sounds so easy! The Instabt Pot Dui doesn’t have a manual button. Would you select pressure cook and then 5 minutes? On what level of pressure?